If you’re like me, your emotions around the on Thanksgiving eve are a mixed bag. On one hand, I’m soooooo looking forward to celebrating Thanksgiving! I love getting the chance to relax and spend time with extended family, being in a cozy house filled with the smell of delicious food cooking, listening to all the kids playing and laughing, and of course, drinking good wine! Perhaps this little story will shed light on why my hands look a little different. When I was a little girl, I’d turn on the Macy’s Day Parade at 9:30 sharp. The big allure, though, was never the floats or the musical performances. Instead, I’d turn it on and hear angels playing their golden bells to officially ring in the start of the holiday season! But now that I’m a Mom, the angel’s bells sound more like a bullhorn sounding at the start of a race. Ready or not, it’s go time! 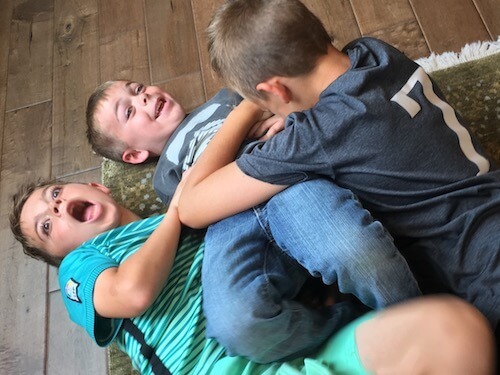 While I feel ready today to soak in the childlike magic that I still love about the holidays and revel in seeing on my boys’ faces … I keep hearing a little voice whispering reminders of all I need to do to prepare. And man, that little voice can surely whack at my whimsy! What about you? Unfortunately, those whimsy-whacking whispers will distract many from fully enjoying all the magical moments that they could be enjoying this holiday season. But that won’t be the case for me … or YOU!!!! Consider this an early holiday gift. Here are 10 easy ways to slow things down so you can rekindle your childlike anticipation and enJOY your holiday season! Decorate your house as soon as possible to prolong the season. Sometimes we put it off because we’re too busy or don’t feel ready. But bringing in the magic early and giving yourself a little extra cushion of time to get it all done will help relieve some of the pressure. Reframe your language around your to do list. This season only comes once a year. And no matter how stressful or busy it can be, it’s still a magical season. Try using the phrases, “I get to”, “I want to”, or even “I’m going to”, rather than “I have to”. This can neutralize any negative energy you feel toward your to do’s. It can even shift daunting chores to little blessings. Give yourself a few moments each night to check-in on your to do list so you feel organized and on top of your game. Then try saying a little gratitude prayer for all the things you’re in the position to do to make this holiday season memorable for your loved ones. Shop a little bit each day to keep anxiety at bay. Spend a little time researching what holiday activities you want to do with your family and friends. Put them into your calendar to keep that time protected. Set a reminder so you don’t forget about them (I wrote this one for me). Turn your favorite holiday tunes on every chance you get and let the music move you. This is a great when when that whisper becomes more like a bellow! Fill your home with your favorite holiday scents. Take some long, relaxing breaths to enjoy them, allowing stress and anxiety to melt away. Start each morning by setting an intention for how you want to feel. Close your eyes, breathe in the feeling you want to experience (engaged, joyful, happy, relaxed, loving). Sit with that feeling for a few moments, and exhale. Smile, smile, and smile some more. If you don’t feel like smiling, smile anyway! Smiling releases mood-enhancing hormones that will help keep you in the holiday spirit. Prioritize your daily wellness practices. You’ll enjoy the holidays more if you’re engaging in practices that keep you feeling good physically, emotionally, and spiritually. Holiday BONUS Tip: It’s easy to get off track with your workout routine during the holidays. Working out will actually enhance your holiday season by giving you the extra stamina you need to make it through this busy season. Even more, it will help you burn off those holiday cocktail and cookie calories!